Normally home to world-class physicists, Canada’s Perimeter Institute also plays host to another high-caliber gathering of thought leaders, change makers, and young visionaries, the Equinox Summit. The 2013 Summit, underway from September 28th – October 3rd, 2013, is focused on reinventing education to equip new innovators to tackle the complex problems facing today’s world. The summit theme arose from a timely observation: children born this year will be graduating high school in the year 2030 and will face a host of ongoing challenges, including climate change, economic instability, sectarian violence, not to mention those problems we haven’t yet even imagined. Don’t get me wrong – content matters. We need to be familiar enough with our history to understand just why rebuilding relationships with our First Nations matters. We need to know enough about the ecosystems around us to understand how we’re affecting the climate and what that might mean for so many people. We need to understand enough about science to address pressing human needs for the benefit of us all. But what we learn will only take us so far. Instead, the education of 2030 needs to teach us how to do three things: how to work across disciplines, how to work across communities and knowledge systems, and how to work well with others who are just like ourselves. Although disciplines have become powerful structures in modern academia (often enforcing core norms & beliefs through controlling the hiring, publishing, and teaching processes), the idea of working across disciplines has long been valued by educators. We idolize polymaths or Renaissance Men like Leonardo da Vinci, and we’ve built Liberal Arts, Arts & Science, and other innovative programs to pursue such goals in contemporary times. Yet, effective interdisciplinarity practice remains an elusive goal. Developing meaningful connections across disciplines requires skilled practice, as does being able to assess such work in a way that cuts through superficial references and using the buzzwords of interdisciplinarity. Meaningful cross disciplinary work also requires the combination of both interdisciplinary practitioners (those individuals able to generate innovative ideas, facilitate communication across these gaps, and synthesize disciplinary expertise) and interdisciplinary collaborations (groups who bring together specialist expertise in diverse skill areas, and are able to leverage this expertise to get past shallow interdisciplinarity). Several academic efforts are underway to learn about, facilitate, and improve these kinds of interdisciplinary collaboration. At Arizona State University, we are playing host to a project that brings together international research communities working on Sociotechnical Integration – that is, interdisciplinary practice that addresses both the social & scientific dimensions of complex problems. We were also involved with the First Global Conference on Research Integration & Implementation at the Australian National University, a meeting that brought together an even wider swath of projects related to inter- and transdisciplinary work (and has opened their talks and content for public viewing online). Ongoing student driven initiatives are also pushing forward the cutting edge of interdisciplinary practice. 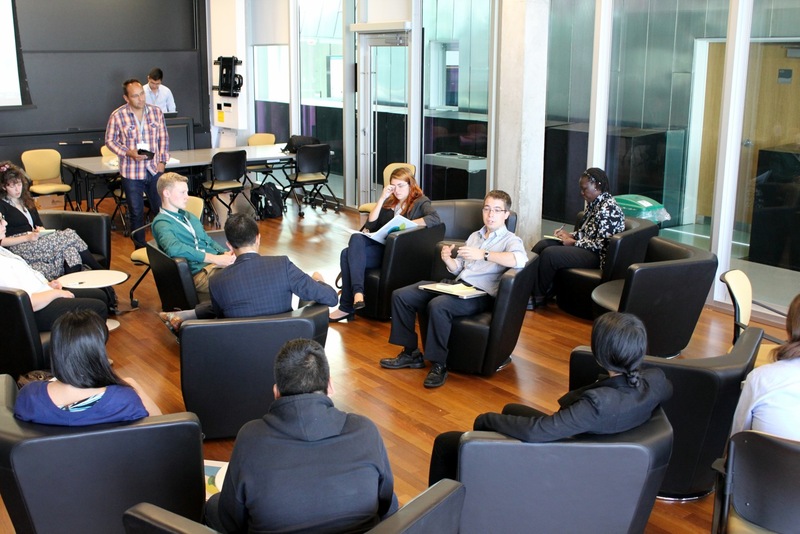 The Combining Two Cultures conference run by undergraduate students in Ontario provides a fertile ground for supporting inter- and transdisciplinary pursuits at the undergraduate level, and challenging the notion that being a ‘jack of all trades’ means being master of none. Other associations, like Graduate Students in Integrative Society & Environment Research at Arizona State University run independent funding programs to advance new interdisciplinary research that benefits society as a whole (and are at the vanguard of wrestling with what it means to get beyond the buzzwords of interdisciplinarity on a campus that has, itself, been transformed into a 70,000+ person interdisciplinary community). Another major focus of attention today is the idea of government and academic experts working directly with grassroots communities to produce knowledge and change. This is important for several reasons: ensuring that local knowledge and expertise isn’t ignored by outside experts, engaging with a more diverse set of collaborators in hopes of creating innovative solutions, and achieving higher levels of buy-in and trust to decisions that require community acceptance and behavioral change. Much as the graduates of 2030 need to be able to work across disciplinary boundaries, they also must be able to work productively and positively across communities of diverse stakeholders. Part of the solution involves an attention to ‘epistemologies’, or the ways that an individuals’ beliefs, values, experiences, and perspectives differ in unique ways. Epistemologies certainly vary across disciplines, whether in the different types of knowledge and certainty pursued by each, or in the contrasting professional cultures, attitudes, and norms that emerge within. They also vary substantially across communities – think of the differences in experience, world views, and beliefs between Aboriginal and non-Aboriginal communities. Being able to work effectively across these knowledge systems doesn’t mean that we can’t know anything or that all knowledge is relative, but rather that the graduates of 2030 need to cultivate the abilities to listen, understand, and empathize if they are to be effective leaders or scientists. These kinds of differences between communities are also present – and powerful – in the institutions we create. Our governments, companies, and civic associations are all embedded with structures that affect what kinds of knowledge they pursue (e.g., preferring statistics to ‘messy’ qualitative data), how they collect & organize that knowledge (e.g., creating the census or election systems), and how they use that information (e.g., setting tax rates or deciding who gets access to certain benefits). These ‘knowledge systems’ form lenses through which we see the world, bringing certain things into focus while obscuring others, yet usually remain hidden and unquestioned. The graduates of 2030 need to be aware of the power that knowledge systems and epistemologies can have in shaping how we understand and interact with the world, and be empowered to confront and reimagine them in creative ways. To empower students to engage constructively with a world of complex, intertwined problems, and to be able to work across disciplines and communities requires one more skills: that we’re able to work well with others – others who are just like us. In discussions of interdisciplinarity, this point is often obscured by a focus on the mechanics and logistics of working with those from other disciplines. Indeed, this focus is important – interdisciplinary work requires the ability to learn new languages, engage in new methods, and appreciate different theories and perspectives. Yet, it also requires an ongoing commitment to the relationships and personal dynamics in play. Scientists and other researchers are beginning to realize the centrality of basic issues like trust and buy-in, and the importance of developing interpersonal skills and creative aptitudes as part of a rich scientific education. To this end, check out a conversation I had with TVO (Television Ontario) about the role of collaborative learning. Perhaps more challenging, though, is the realization that those we may passionately disagree with are, by and large, just like us. We each bring with us the trappings – both good and bad – of differing disciplinary training, epistemologies, and knowledge systems, which can lead to very different ways of approaching common problems. Indeed, it’s exactly the abilities to navigate that messy terrain that will prove most important for the graduates of 2030. Interdisciplinarity, innovation, and collaboration might be the buzzwords of today’s academics, but we’re still a long way from figuring out how to do these things in a meaningful & substantial way. As we look towards training the high school graduates of 2030, we’d be wise to focus more on how we teach ourselves to work between disciplines, communities, knowledge systems, and people just like us.